Joseph’s brothers traveled back to Canaan and told their father Joseph is still alive and that he is the governor of Egypt now. Joseph’s brothers told Jacob that Pharaoh had invited them to live in the best land of Egypt where they will have plenty of food in Goshen. Jacob was so happy when he heard the news that Joseph is alive. Jacob packed everything and get ready to move to Egypt with all his family members. There were a total of sixty six persons in the family to travel with Jacob to Egypt. 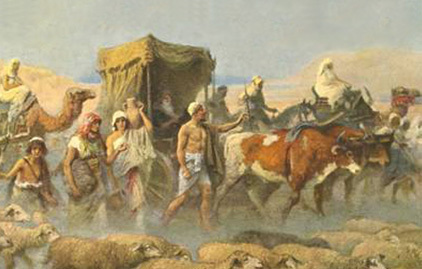 They also took along all their possessions and livestock. Jacob asked his son, Judah to point the way to Goshen in Egypt. When Jacob and all his family arrived at Goshen, Joseph rode on his chariot to meet them. When Joseph saw his father, Jacob, he was so happy; he hugged him for quite a good while. Then Joseph went to announced Pharaoh the arrival of his family. Joseph took along five of his brothers to be presented before Pharaoh. So Jacob and his sons and all his family dwell in the best land of Egypt, Goshen, in Rameses. Joseph provided his family with bread during their stay in Goshen.